So give yourself a time frame or the situation may possibly have one. Of course there are some decisions you can’t rush. Circumstances need time to play out. But don’t fool yourself, there always comes a point when you need to decide. Putting it off any longer than that is just making excuses. Ask the advice of a friend. One who knows you really well, warts and all, and one who’ll be honest with you? It can be tricky asking for advice and then not acting upon it. But advice is like a present, we should give it freely and be able to receive it without obligation. A good friend has your best interests at heart and wants what’s best for you. Weigh up the pros and cons. Don’t be afraid to make a list. Writing alternatives down focuses thinking. This makes options more concrete rather than random swirls of thought which come and go. And follow that hunch. There’s a lot being written about the power of our inner voice. And sometimes if we allow ourselves to shut out all the other dialogue we can hear the answer we need. When the decision is done you really do feel lighter. Take comfort in the fact there are no guarantees, because no matter what you decided you cannot control the outcome. 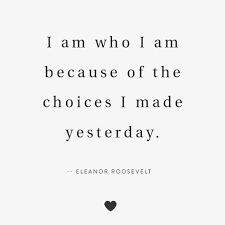 The most interesting people I know have made some decisions they regretted but others which have transformed their lives. < Do You Need Creative Inspiration?